First, Learning Communities are not a new thing. Like the rest of the world, the educational landscape is greatly changing. With the advent of the internet and modern technology, classroom walls have disappeared as educators are able to make the world the new classroom. This new learning environment allows both educators and students to expand their learning connections and develop powerful learning communities that span the city, state, country, and globe. Definition – Does it matter what we call these learning environments? As for teachers, it is imperative that educators share curriculum, effective instructional strategies, and assessment, in order for the school community to accomplish the goals of the common core. How does a learning community benefit educators? It builds professional knowledge allowing educators to make meaning of work while providing best practice leading to student success. Learning communities are open 24 hours a day, 7 days a week and can be accessed from anywhere to everywhere. These learning communities remove educators from the isolation of their four walls and provide a supportive team rich in resources, reflection, and feedback. New resources, tools, methods, and research are constantly made available… many times within minutes of creation, production, or publication. They provide a way to promote and model life-long learning allowing for necessary transformation and change that has become a mandate in today’s education environment. The Ten Step Approach To Developing A Learning Community. 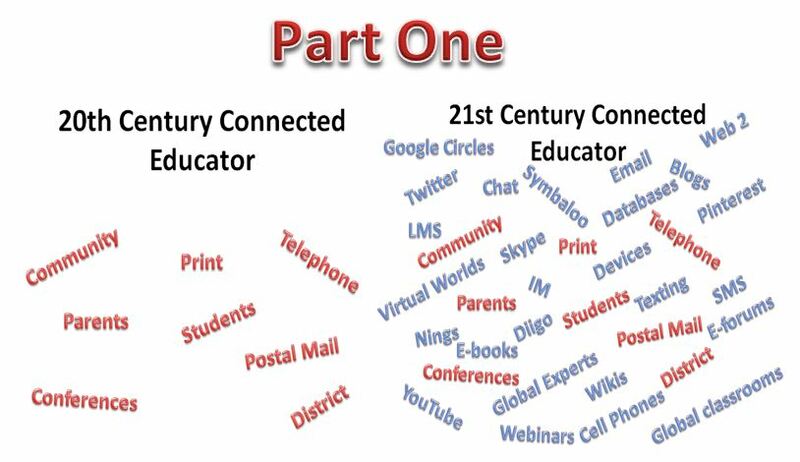 Developing Awareness: Teachers must first develop the awareness of what a modern PLN or PLC is. The concept is not new… but it has expanded. While these communities have always existed as school grade levels, departments, and entire faculties… they never extended much farther. Becoming aware of this new community that extends beyond the school and district boundaries is a first step. Taking The Big Plunge: Becoming aware is important, but taking the plunge is necessary for the process to begin. The plunge involves not only learning about, but actually getting on the web to investigate the rich opportunities and possibilities. This sometimes means taking a step outside one’s comfort zone. The experience is well worth it… especially when the reward is the next step! Experiencing The WOW Moment: The plunge suddenly results in the “Wow Factor.” Educators become amazed and somewhat overwhelmed by all of the resources and opportunities. They begin to bookmark, copy/paste, commit to memory, and take notes on all the possibilities. It is in this phase that the art of curation becomes important. More on that later.. Enter The Time Warp: Ever seen time fly by? Well, it sure begins to as goldmines of resources and amazing tools are discovered. Read this article, check out this app, watch this webinar, or wow… another cool website! By the way… what time is it? I think I forgot to eat breakfast, lunch, and dinner! Making The Big Grade: The “WOW” becomes bigger and bigger as time goes by like the speed of light… or at least kind of close. Soon teachers must begin to do what they have always been known to do. That is, making the big grade, assessing the situation and all it’s possibilities. Experiencing The Light Bulb Getting Brighter: As the light bulb begins to illuminate this new path, discoveries are made. Educators realize they can’t connect with everyone nor can they read every collection of resources on the web. After all, they do have to teach and there are new things on the web everyday! Possibly there are some resources that apply best… and others people who can help and assist! Perhaps with the help of their growing and helpful new learning community they spend less time doing all the work themselves! They now have time to discover the thought of making it all a reality in the classroom. Putting Into Practice: Many times educators find outstanding material but seem to save it for someday. Sooner or later, they try a resource or tool from their learning community in their classroom. The “WOW Factor” re-ignites them and the fruits of labor can be seen. Maybe it is time to share the success or contribute a resource to their learning community. Paying Ahead To Others: It might just be fun to share, comment, author, and contribute. After all, if one gives back a little so much more is discovered… especially with the help of that awesome learning community. In fact, the educator has now taken one step closer to being a fully certified contributing member! Thinking Like A Living Museum … And – The day comes when one cannot find that awesome resource they bookmarked or placed somewhere. Perhaps it is time to take a new journey into learning communities and discover the ultimate ways to curate their resources. “The WOW Factor” returns when they find that curation, collaboration, and discovery can all fit together using some awesome new Web 2.0 tools.More on this in a later blog in November. That’s a little bit of the next post! Great breakdown of the process for life long learning. I am always trying to get the teachers in my department to want to do this. How can we provide the resources and motivation to help teachers see that this is so beneficial? Teachers sometimes feel there is just no time in the day when they have families to take care of- they think PLNs are too time consuming. We say we want our students to become life long learners, but don’t always practice what we preach. Can’t wait to hear what you have to say in Part II. I really appreciate this post. The references to CCSS.ELA-Literacy.CCRA.SL.1 and CCSS.ELA-Literacy.CCRA.W.6 to place a sense of urgency on those who have hesitated to build their own and their students’ PLN is important. Furthermore, the reasons to build a PLN are strong. I particularly liked, “Perhaps with the help of their growing and helpful new learning community they spend less time doing all the work themselves! They now have time to discover the thought of making it all a reality in the classroom.” The power of “we” allows us to focus on student-centered learning. — Building that human infrastructure is so important! It’s easy to get overwhelmed by all the options. I’m beginning to wonder if the tools educators choose have to do with teachers’ personal learning styles. Can we expect teachers to use all these tools? To at least be familiar with all of them? To learn one or two per year? My hunch is to say that teachers should be familiar with all the tools so that they evaluate which meets their professional development needs, which meet the instructional needs of the classroom, and which meet the needs of students. So the next question….How can we, as teacher leaders, model the use of these tools?